Tajikistan is a country in Central Asia. It was previously part of the Soviet Union. Tajikistan is a republic. The capital city is Dushanbe. The official language is Tajik,which is a dialect of Farsi (Persian). Estimate from State Statistical Committee of Tajikistan, 2008; rank based on UN figures for 2005. Tajikistan is a member of the Commonwealth of Independent States, the CIS. Tajikistan is eighth in size of CIS countries. Tajikistan is one of the new countries in South-central Asia. It is west of China, north of Afghanistan and Pakistan, that is separated by a narrow 14 km strip of Tajik claimed land known as the Wakhan Corridor in the Pamirs, east of Uzbekistan and south of Kyrgyzstan. 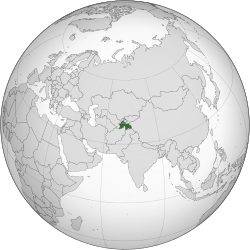 Tajikistan is landlocked in the middle of the continent of Asia. Its total area is only about 143,100 square kilometres (55,300 sq mi). It is slightly smaller than Wisconsin, USA. Tajikistan’s borders total to 3,651 kilometres (2,269 mi) long. The climate has hot summers and mild winters. Almost all of the country (85 percent) is mountainous with river-valleys running across, however high altitude mountains of Pomir are in the eastern part of the country, (which is the west end of the Himalayas). The climate there is semiarid to polar. The mountains cover an area of about 120,000 km2 (46,000 sq mi). There are other countries within the mountain range. The mountains are between 3,600 to 4,400 metres (11,800 to 14,400 ft) high. Karakul lake is located within a 52-kilometre-wide (32 mi) meteorite crater, which would have formed about 25 million years ago, or less than 5 million years ago. In the year 800, Islam came to Tajikistan. In 1868, Tajikistan became a Russian Colony. It later became a part of the Soviet Union . On 9 September 1991, after long periods of mass protests against Soviet Government, the Parliament of Tajikistan declared independence from Soviet Union, and held first presidential elections. Rahmon Nabiev, who ran the country during Soviet Union in the late 1970s and early 1980s, become its president. He was unable to bring any much needed reforms to the country, and so there were protests in the capital city, Dushanbe. The government responded by organising a pro-government demonstration, mainly made of old Communist Party members and people from the southeast of the country brought to the city. Anti-government protests did not stop, so the government gave weapons to the pro-government demonstrator. Then the Opposition armed themselves. After this bloody civil war broke out. In which all of the new democratic parties, political organisations and movements together with the political Islamic movements created an alliance, opposing the old communist government and southerners. After the September 11, 2001 attacks, many American and French Soldiers came into the country. Tajikistan is divided into 4 provinces. ↑ Constitution of the Republic of Tadjikistan, November 6, 1994, Article 2. ↑ 3.0 3.1 3.2 3.3 "Tajikistan". International Monetary Fund. Retrieved 2010-04-21. ↑ "Human Development Report 2009: Tajikistan". The United Nations. Retrieved 2009-10-18. 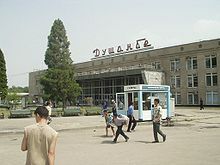 ↑ "Kara-Kul Structure, Tajikistan". NASA Earth Observatory. Retrieved 2006-05-25. .